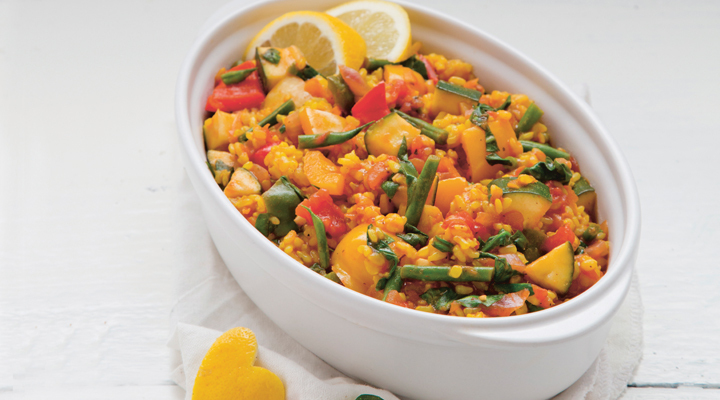 This tasty vegetable equivalent of a traditional Spanish seafood dish is always one of our most popular recipes. It’s naturally low in fat and calories and high in nutrition and fibre. Put the rice and veg stock in a large pot. Add the turmeric and mix it through the rice to give it a lovely yellow colour. Put the lid on, leaving it slightly ajar, and set on a high heat. Once it boils, reduce the heat to low, leave the lid ajar and simmer until all the water boils off and the rice is soft and cooked through. This will probably take about 40 minutes. If you find that all the liquid is gone and the rice is still not cooked, add a bit more water, preferably boiling water, and mix well. Put the onions and garlic in a separate large saucepan with the water. Sauté on a medium to high heat for 5 minutes, adding more water if the onions and garlic start to stick to the bottom of the pan. Add the grated carrot and 1 teaspoon of the salt and simmer for a further 3 minutes. Add the chopped tomatoes, red wine, mixed herbs, smoked paprika and black pepper. Turn up the heat until it boils, then reduce to a simmer for 5 minutes. Now add the chopped peppers and courgette to the tomato sauce along with the lemon juice, soy sauce, maple syrup and the remaining teaspoon of salt. Mix well and cook on a gentle simmer for 15 minutes, until all the veg are cooked. Once the rice is cooked, add the tomato sauce and veg along with the green beans or baby spinach. Cook for a few minutes more, mixing everything together well. Taste and season with more salt and pepper if it needs it, then garnish with the chopped parsley and serve.